To be surprised when I come across low fat holiday meals recipes. I always thought Christmas was the time to pig out. No? Oh, am I doing it wrong? To hope the kids go back to school Wednesday They had a snow day last Friday AND yesterday AND today. This just proves I could never homeschool. I need my quiet back. Stat. To wonder what is going to happen in Scandal when it returns. So many different plots! To roll my eyes a bit when parents say I don't have the right to pierce my daughter's ears since it's not my body. Look, I carried her body and pushed it out of me, therefore I'll pierce her ears if I want. Thanks. To be buying Despicable Me 2 today. We're getting it at WalMart since the copy comes with minions. To have a giveaway for a $40 gift card to Novica.com here. I also have a $25 NAPA car care card here and a Blu-Ray DVD here. Go enter! 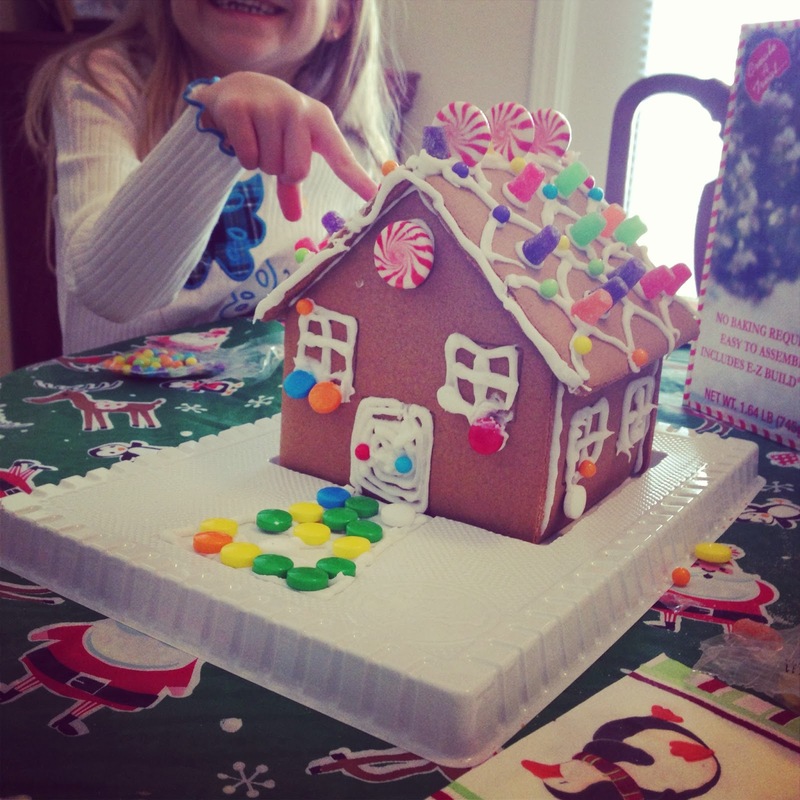 To have made a gingerbread house! That didn't fall apart! Normally the ones I put together fall apart. Hey- it's alright to have giveaways! Thanks. I am trying to decide if I prefer snow days to sub zero, can't be outside more than a minute days. Neither is top of my wish list. My sister and I make a gingerbread house every year, with varying success. I could never homeschool. My daughter was throwing a fit about school today and we were very late and I was horrified for a few minutes to think I'd have to keep her home with me. Noooo! Love the gingerbread house! And I can't wait for Scandal to return either. I'm on the edge of my seat watching it! Happy Anniversary! Your gingerbread house looks great! Mine never work out so I gave up on making them. Happy 12 years!! Woo Hoo!! And yeah, I'm eagerly waiting for Scandal to come back. I'm totally out of my mind excited I have a 2 week vacation coming up. And it can't get here quick enough! Three snow days? I would be going in.sane. by now. Hopefully they can head back tomorrow!! Happy anniversary to you and Tom! Happy Anniversary - sounds like a pretty good day (minus the no-school thing!). I bought Despicable Me, too - can't wait to see it! happy anniversary! and yay scandal! you know it's on this week, right? I'm so curious what will happen on Scandal too! Last week's episode was crazy! Happy anniversary! I hope your kiddos have school tomorrow. Mine have been out for two days and they are late tomorrow. I'm ready for them to go back!! I've never had a house stay together! Lucky! I also pierced both girl's ears when they were only months old. My mom did it to me, and I turned out just fine. If they're so against it, they can take them out when they're older. Happy Anniversary! I hope you have a lovely celebration. Love the gingerbread house! Our secret is to put a big tin can inside to hold up that walls until the gobs of icing dry. I think hubby actually used some kind of clips from his tool box one year.